Discover the beauty of sailing in Greek islands! One of the finest marinas in the Mediterranean and without any doubt one of the most beautiful in Greece. The marina of Skiathos is surrounded by traditional taverns, quality restaurants, coffee shops and bars. The marina of Alimos is located South-West of Athens and is one of the largest marinas. Porto Koufo is a natural and very beautiful safe harbor which is located in the second peninsula of Chalkidiki . Now find also Motor-Yachts available in Ionian islands! Click here to check it! Call us today +302310465269 or send us your phone number here and we will call you back! Discovery crew is proud to provide the highest level of service possible and the greatest reward is the smile of our clients every time. 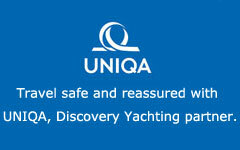 -Available information onboard our yachts for the environmental protection of Greek Seas. -Discovery Yachting places the protection of the environment in priority, creating a policy of ecological briefing, convincing, our clients/charterers who sail with us, to live the unique experience of yachting by opening the Sails and turning off the engine. During the check in procedure and briefing, we inform our clients about the advantages of opening the sails and turning off the engine. The profits of this briefing help in the reduction of emissions of pollutants that cause the greenhouse effect and constitute a measure for the protection of our environment. or send us your phone number here and we will call you back.